Walking a few yards further along St. Nicholas Street brings you to Solomon Theakston’s former bookshop at No. 31, now an entrance to Marks and Spencer’s store. Theakston was a 19th century Scarborough ‘institution’, well patronised by both residents and visitors during his period of ownership from 1841 to 1875. He was neither the first nor the only bookseller in town, but certainly ended up as the best known. Theakston, a native of York, opened a library and bookshop across the street at No. 6 in 1828. He transferred the expanding business to larger premises on the other side at No. 31 in 1841. The move enabled him to house not only his wife and himself, but also an amazing variety of enterprises behind the Georgian façade of the building, which had originally been a lodging house. From 1845 onwards, he printed and published on the premises the weekly ‘Scarborough Gazette’, with its accompanying list of visitors, as well as a popular guide book to the town which ran into many editions between 1840 and 1881. In addition to the library and bookshop, he set up a fine arts gallery, where H. B. Carter, a celebrated painter of local scenes and seascapes, exhibited and sold many of his works. Tickets for the Spa Theatre were on sale at Theakston’s; you could also buy wallpaper there, and even arrange to collect your mail at No. 31. When Solomon Theakston died childless in 1875, aged 64, his former clerk, John Haygard, continued all the business activities until 1895. The Theakston ’empire’ then went gradually into decline and was ultimately acquired by W. H. Smith and Son Limited. From 1904 W. H. Smith’s traded as booksellers and stationers at the premises until moving to a new purpose-built shop on Westborough in 1981. 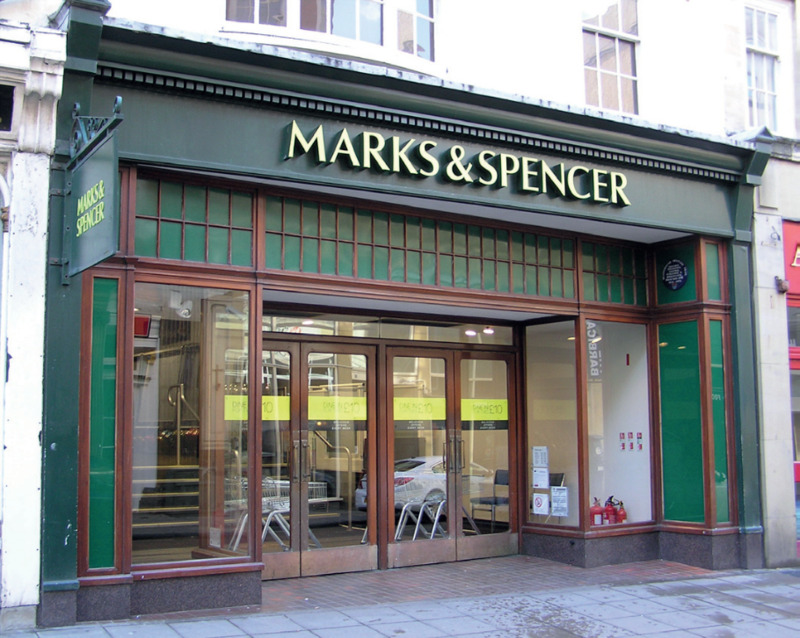 The site was then purchased by Marks and Spencer and incorporated in a major store extension. The present St. Nicholas Street frontage is a replica of the late 18th century building. Marks and Spencer gained a local Civic Society award for this work. When you reach the end of St Nicholas Street, turn left on to the Newborough pedestrian precinct and walk as far as North Street. This marks the historic site of the original Newborough Bar. 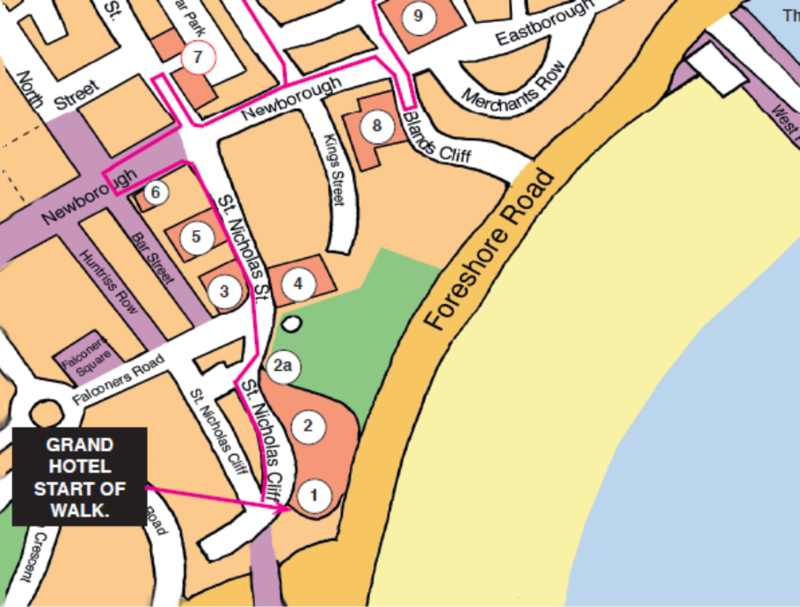 Click here to continue your walk to 6 Newborough Bar.